Generally speaking, media studies is an interdisciplinary field that examines the influence of media on society. This means researching and teaching about how media impact and are impacted by institutions, states, audiences, cultures, economics and technology. Among the various topics covered by the discipline, core theory courses and electives typically include a survey of media, culture and society, digital media, theory, ethics, globalization, propaganda, politics, gender and race, film, intercultural communication and celebrity culture. However, with exception of the field of environmental communication, in terms of ecological themes and sustainability there are very few examples of “green” methods that can be incorporated into media studies classrooms. In spirit, though, many of the aims and aspirations of media studies are in alignment with education for sustainability. As Blewitt (2009) proposes, they have in common the goals of participation, action and critical engagement. Communication and cultural studies in their egalitarian modes parallel science’s utopian and visionary aspirations… Both participate in a common Western 20th-century intellectual journey and are still rounding similar corners: the linguistic turn where everything seemed to hang on language; the feminist sweep that transformed contents, methods, and paradigms; the self-reflexive curve where everyone had to demonstrate awareness of their own practices; and the postmodern bend where everything had to be relativized and decentered. In traveling such paths, communication and cultural studies have done more work than science, yet both need, to stay true to their respective projects’ emancipatory roots, to come to terms with the environment and its ecological imperatives as the fourth dimension of social space. Given that our ecological crisis is primarily cultural, sustainability education should investigate the role of media in shaping core attitudes about the environment, and media educators should consider the environmental dimension of their work. A cursory look at the relationship between media and the environment reveals that they are in fact deeply connected in two distinct ways. First, media gadgets and the server farms that network them together create a massive ecological footprint. Gadgets (cell phones, laptops, tablets, personal computers) are produced with toxins and plastics that can’t be recycled, and as a result of their built-in obsolescence, rapid manufacture and disposal, they cast a toxic shadow across the planet. Additionally, servers and the so-called data cloud are coughing up CO2 emissions equivalent to the aviation industry, and will likely double this amount in ten years (Alakeson, 2003; Greenpeace International, 2010; Leonard, 2007; Lewis & Boyce, 2009; Tomlinson, 2010). Secondly, media promote unsustainable cultural practices, such as unlimited economic growth and consumerism, which are at the heart of our ecological crisis. From this perspective, an ecological critique of communications technology would be an excellent opportunity for media educators to expand the horizon of the discipline’s democratic aims. However, in media studies communications technologies tend to be celebrated as symbolic of human progress, while a critical approach is relegated to the territory of so-called Neo-Luddites (see Maxwell & Miller, 2011 for a discussion of why media studies tends to be uncritical of technology). The situation is compounded by environmental educators who eschew studying media technology on the grounds that ecoliteracy is about “nature” and not technology (Kahn, 2010). While experiential nature initiatives certainly remain an important aspect of ecoliteracy, it is also important to be ecologically literate about the primary environments that we engage on a daily basis: our media. As inhabitants of the global capitalist realm, computer networks are embedded into our lives as much as the places where we live; we are increasingly a “networked society” with our cultural practices deeply impacted by software design (Rushkoff, 2011). So when Jensen (2002) argues that media are “institutions-to-think-with,” he reminds us that studying media offers the opportunity to map institutional paradigms that underlay our economic and social systems. Subsequently, media impact our beliefs about the world because they are central to “the production and circulation of meaning in modern societies, enabling collective reflexivity and coordinated action on an unprecedented scale” (Jensen, 2002, p. 9). Given the ecological dimension of the media, how does one approach bridging these concepts in a media studies course? Because typical media studies textbooks do not incorporate sustainability into course content, there are few practical examples to draw from. In response, I have developed an experimental pedagogical framework, Ecomedia Literacy, which explores media from a sustainability perspective. In 2011 I had an opportunity to put the framework into practice while teaching two sections of a digital media culture course at an American liberal arts college in Rome, Italy. Both sections combined for a total of 43 students. Previously I had taught this course three times, but this was the first instance I deliberately “greened” the course’s structure and materials. My goal was to work within the university’s standard requirements while introducing a green framework based on Ecomedia Literacy. The primary method for this approach is a heuristic I developed called the Media Wheel, which I used as a structuring device for the course content (a detailed explanation follows in the next section). I divided the 14–week course into six sections: introduction (including an overview of the Media Wheel), the Media Wheel’s four areas of inquiry (worldview, ecology, political economy and culture) and conclusion. Course activities included field assignments, online forum posts, Prezis (multimedia presentations), papers and making YouTube videos. Online forums were located at the course’s parent Web site hosted by me. We met twice a week in a physical classroom with each session lasting an hour and fifteen minutes. My method for evaluating the effectiveness of the course design was based on reviewing final papers, online forum discussions, anonymous student evaluations collected by the university, in-class interactions and participant observations. This essay details the theory, implementation and the results of this case study. In this section I outline the impetus for my design approach to the course curriculum and offer a short overview of its theoretical framework. In the field of media education there are major divisions about how media should be taught, which generally falls under two approaches: functionalist and critical (Gutiérrez-Martín & Tyner, 2012). Functionalist media literacy teaches practical skills for how to read media messages, and is also linked to information literacy. It is generally apolitical and does not promote any particular kind of activism. Critical media literacy, on the other hand, acknowledges that media play a significant role in defining power relationships within society. This approach is usually associated with activism and is not neutral when analyzing media messages. Though I sympathize with its orientation, oftentimes the critical approach can be abused for the purpose of promoting a “protectionist” agenda, which views media audiences as powerless or as victims. Protectionists try to “inoculate” students from potential harm caused by media corporations or advertisers. The primary method of this technique is media deconstruction, which involves teaching students how to analyze media messages, such as tobacco or alcohol advertisements. In 2002 I was trained in a method of media literacy that is angled towards protectionism. However, I became uncomfortable with this approach while working as a professional media educator in Native American communities from 2000-2006. The essential problem is that the protectionist approach is one-dimensional. From an ecoliteracy perspective, media literacy needs to be grounded in place. Media are not experienced in disconnected contexts. For many media education approaches, local cultural realities are often disregarded or viewed as irrelevant to the specific task of media deconstruction. This was particularly evident in Native communities where I often had to recontextualize media to make sense of the context of their own community realities. For example, many protectionist media literacy advocates demonize tobacco, but in Native communities it is necessary to distinguish between traditional and commercial uses of tobacco. Native community members have told me that media literacy activists have alienated them out of a lack of respect for their traditions. This experience jives with Bowers’ (2005) critique the Freirean critical pedagogy approach where progressive political agendas eschew the importance of tradition and cultural continuity. Not surprisingly, critical pedagogy (like Freire’s) is a guiding framework for critical media literacy (Kellner & Share, 2007). Secondly, more attention needs to be paid to the subjectivity of students and how different communication forms have particular media ecologies. Traditional media literacy rarely distinguishes between the forms of TV, magazines, film, Internet or radio on how they influence content. In fact, they generally treat content as independent of the form it comes in. But as scholars from the so-called media ecology tradition (think “medium is the message”) have noted, depending on medium, communications can vary greatly (Meyrowitz, 1998). For example, reading printed texts involves different cognitive and sensory experiences than multimedia; and written communications convey messages differently than visual or aural media. The Native American students I worked with were primarily versed in the oral tradition, which is much different than learners who are raised in print environments. In practice this means that print-oriented educational approaches tend to promote text literacy as a response to multimedia, whereas I found that arts-based and storytelling practices work better in oral cultural environments. Finally, and most importantly, in terms of advocating sustainable cultural practices, media studies (and by extension, media literacy) for the most part does not deal with environmental issues. While working with Native Americans I experienced a cosmological difference between my background in media studies and how Indigenous communities regard the world. In short, media studies is intrinsically anthropocentric, whereas ecocentricism guides the educational priorities of the Native communities I worked in. become conscious of how media impact our ability to engage in sustainable cultural practices by encouraging new uses of media that promote sustainability. All of these fundamental skills fall under the rubric of what I call “green cultural citizenship,” which is embodying sustainable behaviors and cultural practices to shape and promote ecological values. Ecomedia Literacy’s holistic approach to media analysis is based on a heuristic I developed called the Media Wheel, which can be visualized as a circle divided by four quadrants (inspired by, but not an imitation of, Native American medicine wheels). 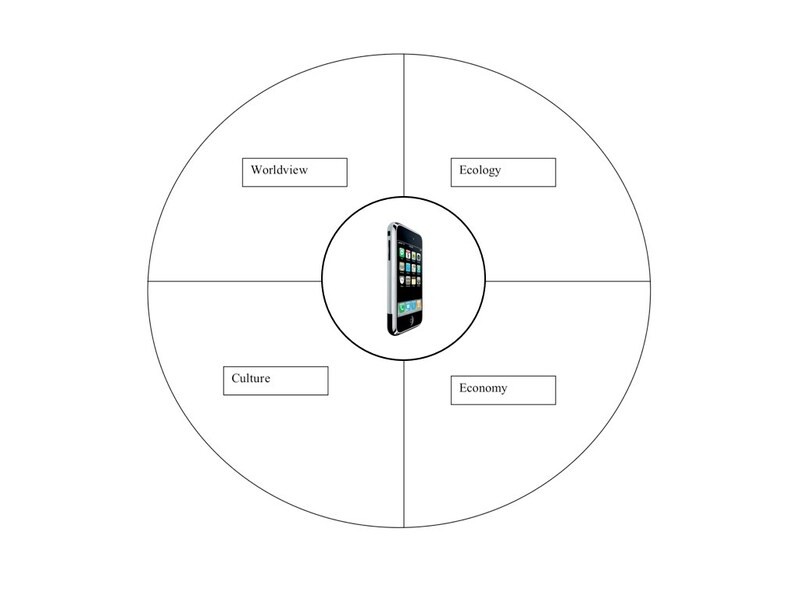 To incorporate the real world experience of the student, during the course we use the Media Wheel to explore a communications gadget by rotating around four perspectives: worldview, environment, economy and culture. From the worldview perspective a media gadget affords particular interactions built into the software design of the internet, social networks, information portals and operating system of the device. These impact a sense of time, space and place. The environment perspective approaches the device according to its “lifecycle”—from resource extraction to disposal. The economy perspective understands the gadget in terms of its role in the global economy, both in terms of it being a commodity and as an enabler of ideology and social change. Additionally, the “economy of attention”—how our interactions are commodified (or not) is explored. Finally, the culture perspective relates to the cultural impact of the gadget, including how it influences status, language, relationships, empowerment and the notion of citizenship and consumption. 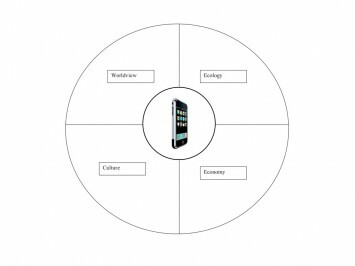 The gadget is at the center of the Media Wheel; it is approached as a “boundary object.” A boundary object is something that has a common identity, but its use and perceived value changes depending on its context. Wenger (1998) uses the example of an insurance claim form as an illustration of an object that has different meanings according to who evaluates it (i.e. someone making a claim, the person evaluating the claim, and the company manager who sets policy for how the claim should be handled). For my purposes the media version of a boundary object can be a technological device (iPhone), space (classroom, internet) or text (TV ad, film, web site, etc.). As a teacher I view my role as being a kind of curator and guide that organizes the curriculum according to the principles outlined above. To do so, I conceive of the classroom as an “ecotone” (see Pendleton-Jullian (2009) for a discussion of educational ecotones). An ecotone is the landscape ecology term for an edge environment, or zone between ecological systems, such as between a forest and meadow. This dynamic border region has aspects of its adjacent zones, but is itself unique. A classroom’s ecotone resides between the realms of academia, the informal media environment of the student’s daily life and the world as experienced through the use of personal media gadgets, such as smart phones. In the following case study, we will get a clearer understanding of how this works in practice. This course is an introductory overview exploring the ethical, aesthetic, political, social and economic dimensions of new digital media, which includes a critical discussion of Internet uses. We trace the history of digital media in the context of traditional media to understand their impact on society. We also seek to determine what the emergent properties of new digital media as they impact culture and society so that we can critically evaluate the various claims made about both the negative and positive social impact of new digital media. Previously I had taught this course three times, but 2011 was the first time I deliberately “greened” the course’s structure and materials. Traditional digital media courses explore topics such as how digital media impacts the media economy, audience participation, intellectual property, changes in perception of time and space, cultural citizenship, aesthetic practices and social relationships. The main difference between my intervention and a traditional new media class was the introduction of two themes. First, students explored how media gadgets impact their perception of the environments they inhabit. To do this students were asked to investigate the impact of devices on their sense of time, space and place through a number of exercises, including media “fasting” and autoethnography using YouTube. Secondly, I had students contrast how digital media gadgets (such as iPhones) are represented in popular culture and marketing against the material reality of their life-cycle process (material production and disposal). They were also asked to apply all the concepts learned during the course to their personal media gadgets. The primary textbooks were The New Media Theory Reader (Hassan & Thomas, 2006) and Doing Cultural Studies (Du Gay et al, 1997). Videos screened during class sessions were posted on the course web site. What follows is a narrative description of readings and activities for each section of the course. To begin the course I wanted to introduce some guiding principles. For the readings I assigned “Pangloss, Pandora or Jefferson?” (Barber, 2006), “Citizens” (Sunstein, 2006), “Introduction” (Du Gay et al, 1997), and excerpts from The Future of the Internet (Zittrain, 2008) and Remix Culture (Lessig, 2008). The theme for the introductory session was to establish the idea of cultural citizenship and how it is important to understand the difference between open and closed systems. Barber and Zittrain lay out various scenarios that will result depending on how the internet and media gadgets are designed. The opening chapter from Doing Cultural Studies was used to introduce the circuit of culture concept and to supplement my explanation of the course’s structure around the Media Wheel. Keep track of when, where, and why you used it, and note in what ways it was used in your life (for good and bad!). At the end of the week, review your diary and then write a one-to-two paragraph observation of what you learned from your diary. Students were required to post their responses to an online forum and submit to me a physical copy of their diary. This section began our exploration of worldview. Themes included technological determinism, time and space, and embodiedness. We started with technological determinism to explore the argument of whether or not media technology can shape perception. For the readings I selected Carey’s (2006) classic article about the telegraph, Mumford’s (1966) deconstruction of the wristwatch, William’s (2003) discussion of technological determinism and TV, and Cooke’s (2006) exploration of the debate of how print impacted culture. For this week’s post I want you to go for a 1-2 hour walk BY YOURSELF with no media gadgets (no books or pens either). You can choose to go anywhere in Rome, but what I want you to do is to just wander around and notice the spaces you walk through. Pay attention to how they are designed. Do these spaces guide you to do certain things? You can go to stores, churches, cafes, where ever. Just pay attention to how these spaces are interactive. After your walk, take notes and write 1-2 paragraphs about your experience. Also reflect on how it felt to do this without a media gadget or book. The assignment was inspired by the radical arts group, the Situationists, who made it a part of their creative process to get lost in urban cityscapes. Rome is a perfect place for this assignment because it has embedded within its environment many different kinds of spatial designs from throughout its 2,700-year history. For this section of the course students were asked to focus on the materiality of their gadgets. For background readings they read sections from Greening through IT: Information technology for environmental sustainability (Tomlinson, 2010), “Talking Rubbish” (Maxwell & Miller, 2009), and Greenpeace’s online reporting mechanism for green technology (http://www.greenpeace.org/international/en/campaigns/toxics/electronics/Guide-to-Greener-Electronics/). Students were asked to use the Greenpeace site as a starting point for looking into the lifecycle of their chosen gadget. In addition I screened the documentary, Manufactured Landscapes (2006), which paints a vivid picture of the material conditions of manufacturing in China. I also screened Story of Stuff (2007) to introduce a systems perspective of consumerism. Additionally, we also looked at various YouTube videos about conflict minerals, e-waste and alternative design concepts like cradle-to-cradle and biomimicry. How valid is Motorola’s claim that its tablet “empowers people”? 1) Start by comparing the history of technology we learned in class (from books to the consumer sublime) with the “Tablet evolution” video. Where does this fit in the history of technological “progress”? 2) Next assess it in terms of open and closed systems and interactivity (hint, it runs on Android) and what implications it has for cultural citizenship (remember our discussion of Barber’s scenarios for the future of digital technology). 3) Assess its potential impact on our perception of time and space (you can base your observations on your own study). 4) How do you think Motorola’s claims of empowerment compares with its potential impact on the environment? Consider the discussion we had in class about Green IT, e-waste and conflict minerals. You can also check out Greenpeace’s ranking of computer companies. Additionally you can also check Motorola’s Website to see if there is any more information about its manufacturing process. In the context of an ecological critique, how “evolved” is this product? Terms/concepts: cultural citizenship, Barber’s scenarios (Pangloss, Pandora, Jeffersonian), enclosure, creative commons, left/right brain, media as extensions, technological determinism (books, telegraph, gadgets, watch), interactivity, spatial literacy, one-to-many versus many-to-many, open source, collapse of time/space, repurposing, creeping cycle of desensitization, consumer sublime, participatory culture, RW vs. RO, open vs. closed, Wikileaks, green IT, GreenPeace, Manufactured Landscapes, Story of Stuff. The second half of the course focused on political economy and cultural production. Students were asked to read Doing Cultural Studies: The Story of the Sony Walkman because it models the circuit of culture approach to analyzing gadgets. Though the book is somewhat dated, its method of research and analysis was intended to show students how to think about the complexity of gadget production, and to understand how culture, design and political economy feedback on each other. To supplement and update the book’s arguments for convergence media and convergence culture, I assigned chapters from Jenkins (2006) and Lessig (2008), and online essays by Kelly (2008) and Barlow (2011). I screened Objectified (2009), a documentary about industrial design that features several interviews with Apple designers. We also tracked the evolution of the iPod’s design through its marketing. During this section students also began researching their gadgets for their final project, which had a written and multimedia component. My method for evaluating the effectiveness of the course design is based on interpreting final papers, online forum discussions, anonymous student evaluations collected by the university, in-class interactions and my own observations. These assignments worked well together. The point of the gadget diary was to get students to see patterns in their gadget usage. The wander assignment was intended to draw attention to patterns when their gadgets were not available. A few basic themes emerged from the diary assignment. First is that a majority of the students were not very introspective of their usage. They mostly reported it without much self-reflection. Common gadget uses, they wrote, were mainly for connecting with friends and family. Some students reported that they were surprised to see how addicted they were to their gadgets. Several of these students became aware of how gadget use is tied to “boredom” and “leisure.” Though these are not Earth-shattering epiphanies, I do consider it a “victory” of sorts just to get students to be conscious of their device usage. For the wander assignment I contemplated the length of the assigned media fast. In past programs back in the United States I had asked students to take a week off from media, but this was before social media and smart phones. Back then (eight years ago) it was a matter of turning off TV, and avoiding music and film. Now student lives are far more connected to the internet, especially in a study abroad program. I realized that I could not make an unreasonable demand, especially considering how parents tether their children to communication devices. By assigning a one-to-two hour media fast I think I was being a bit too gentle, though. But according to the comments, even this short amount of time was difficult for many. The second group—those who detested the experience—wrote of unease, anxiety, fear, isolation, disconnection and loss. These comments seem to confirm some of Turkle’s (2011) conclusions about the psychological dependency of gadgets. Not surprisingly, for this group time seemed to really slow down. Interestingly, those who hated the assignment were in the minority. In general I believe these assignments were very productive. In their final papers many of the students drew upon these experiences to explain their deepened understanding of how gadgets impact their lives. I believe that these assignments in particular fulfilled Wesch’s definition of learning, because whether they liked or disliked the assignments, they connected the concepts about gadgets impacting time, space and place from the course material with personal experience. An important component of the course design was to have students personalize their learning by applying course concepts to a personal device throughout the semester. At the beginning of the semester students were required to track their personal media gadget in relationship to the major themes of the course’s structure. Their final papers explored the gadget from the four dimensions of the Media Wheel. They were also required to apply these concepts to a multimedia presentation using the Prezi platform (follow this link to see an example of a student Prezi from this course: http://prezi.com/gfkhpc6avuzh/lopez-project/). The goal was to ensure that their learning combined multiliteracy and ecoliteracy. Multiliteracy was evidenced in their ability to analyze media texts, use online communication tools, self-reflect with YouTube and research the internet for information about how their gadgets were produced. Ecoliteracy was demonstrated through their understanding of how their media gadgets impact the environment and their experiences of time, space and place. In their written work there was evidence of an awareness of the ecological dimension of their gadgets. However, upon reviewing their final papers, only a small number indicated “breakthrough” awareness about the ecological dimension of their devices. Many papers reflected understanding of the assignment’s goals, but their writing did not generate any particularly enthusiastic calls for change or cultural citizenship. Many wrote somewhat mechanically, reflecting the perceived desires of the professor. However, one key awareness that seemed to resonate with most students was that they understood the difference between open and closed media systems. Unfortunately few related that with environmental themes. It is clear that I needed to do a better job of connecting these issues. Of 43 papers, only ten reported significant new awareness. These students connected cultural citizenship with transparency and open systems. This was particularly common among users of BlackBerry, which has the worse environmental track record among gadget companies and is the most opaque in terms of reporting production processes. Many of these students commented on their previous lack of awareness, and had they known better, they would have made better decisions based on practicing cultural citizenship. In a different course (Advanced Media Theory), I tried to apply the concept of integral ecology—which is similar in structure to the Media Wheel—as a method for organizing media theories. I believe for the theory course this approach did not work because categorizing abstract theories with another abstraction was too confusing for undergraduate students. By making the Media Wheel DMC’s structuring device, it seemed to make more sense to the students because they had to “walk” through the entire process (rather than just think about it abstractly). Unlike the theory course, for DMC the four quadrants were grounded in personally relevant assignments. Additionally, it seemed to work with DMC because of the way I hybridized it with cultural studies’ circuit of culture approach. Admittedly, when I organized the course around the Media Wheel I was unfamiliar with some key concepts from ecological design that could have been useful. For example, I should have incorporated more about the concept of a product’s lifecycle into the section on material reality/environment (part 2) and included more reading materials about sustainability design, such as cradle to cradle and biomimicry design (I did show short YouTube videos about these approaches). Another issue is that the Media Wheel design lacks clear boundaries between some subject areas. For example, it was very difficult to distinguish between the environmental (material) aspects of the gadget from political economy. And it was challenging to separate political economy from culture. Though the point of the Media Wheel is to show how all these work together as an iterative process, I am hard-pressed to find exactly were these different areas of inquiry are distinct. They seem to bleed together quite a bit. About halfway through the semester I asked students to raise their hands if any of them expected the course to be about ecology. None did. Yet, by the end of the semester it was clear that many students understood why digital media and sustainability are connected. In setting out to redesign the course, it was important for me to avoid some of the problems I had encountered with traditional media education approaches. Namely, I wanted students to contextualize theory according to their daily lives. I did not want to be overly didactic, but to make the theories we discussed in the classroom relevant to their personal experience. I also wanted to bridge media analysis with media practice; typically media educators only do one or the other. Though students engaged in traditional course activities, such as reading texts and writing papers, they also used the medium they were studying. As such, I believe I achieved my objective to go beyond functionalist and protectionist media literacy by holistically combining critical, yet personally relevant, engagement with media technologies. Based on student feedback, personalizing the curriculum to make it practical and visceral created the space for them to link ecology with media. The Ecomedia Literacy framework is still a work in progress. It needs to be tested more to see how translatable the framework is for other courses and disciplines. For example, it would be interesting to see this approach applied in a setting that is exclusively dedicated to sustainability studies or in business programs. In terms of lessons beyond greening an undergraduate class, this experience demonstrates that the Ecomedia Literacy framework is flexible enough to be incorporated into other areas of inquiry. In particular, it could be applied to situations that are not focused on gadgets, but instead on media texts or themes related to food, animals, energy or public health. My experience in the media literacy movement, despite its problems, taught me that media education can be a fun and engaging way to teach about social issues. Imagine if environmental educators could do the same by using media to teach about sustainability. The model I offer here is experimental and not definitive. My main goal is to argue for sustainability as multidimensional, and to integrate ecological issues into a standard digital media course that typically eschews the environment. This experiment verified for me that a standard media studies approach can be greened without compromising key disciplinary concepts. In fact, incorporating ecological themes strengthens the study of media because it expands the notions of democracy, social justice and participation that are so important to media studies practitioners. Finally, the case study further reinforced for me that teaching green cultural citizenship should become a widely adapted goal for media educators and beyond. Based on student feedback, I believe they appreciated gaining an awareness of how to incorporate sustainable cultural practices into their media usage. My vision for the future of education is that “green” subjects are not ghettoized and treated as distinct or off topic from those subjects that are familiar to us. I imagine that all media courses one day will incorporate sustainability, and it will be “natural” to do so. Barriers to such a project include a lack of familiarity with ecoliteracy (pedagogy and a basic literacy of environmental issues), resistance from academic gatekeepers who don’t acknowledge the connection between the environment and social studies/humanities, and a lack of concern or desire to change cultural practice. I think all these can be overcome, but it will take concerted effort and it will be up to the practitioners (i.e. teachers, scholars and learners) to push for more integrative approaches to teaching media. Alakeson, V. (2003). Making the net work: Sustainable development in a digital society. Middlesex, England: Xeris Pub. Baran, S. J. (2004). Introduction to mass communication: Media literacy and culture Boston: McGraw-Hill, 2004. Barber, B. R. (2006). Pangloss, Pandora or Jefferson? Three scenarios for the future of technology and strong democracy. In R. Hassan, & J. Thomas (Eds. ), The new media theory reader (pp. 188-202). Maidenhead, England; New York: Open University Press. Bateson, M. C. (2007). Education for global responsibility. In S. C. Moser, & L. Dilling (Eds. ), Creating a climate for change: Communicating climate change and facilitating social change (pp. 281-91). Cambridge: Cambridge University Press. Blewitt, J. (2009). The new media literacy: Communication for sustainability. In A. Stibbe (Ed. ), The handbook of sustainability literacy: Skills for a changing world. Totnes, UK: Green Books. Bowers, C. A., & Apffel-Marglin, F. (2005). Rethinking Freire: Globalization and the environmental crisis. Mahwah, N.J.: Lawrence Erlbaum. DeFleur, M. L., & Dennis, E. E. (2002). Understanding mass communication: A liberal arts perspective Boston, Mass. : Houghton Mifflin, 2002. Devereux, E. (2007). Media studies: Key issues and debates. London: SAGE. Dominick, J. R. (2009). The dynamics of mass communication: Media in the digital age (10th ed.). New York: McGraw-Hill Higher Education. Du Gay, P., Hall, S., Janes, L., & Mackay, H. (1997). Doing cultural studies: The story of the Sony Walkman. London: Sage, in association with The Open University. Esbjorn-Hargens, S., & Zimmerman, M. E. (2009). Integral ecology: Uniting multiple perspectives on the natural world. Boston: Integral Books. Guattari, F. (2008). Three ecologies. Continuum International Publishing Group. Gutiérrez-Martín, A., & Tyner, K. (2012). Educación para los medios, alfabetización mediática y competencia digital. Revista Comunicar, XIX(38), 31-39. Hartley, J., Montgomery, M., Rennie, E., & Brennan, M. (2002). Communication, cultural and media studies: The key concepts (3rd ed.). London: Routledge. Hassan, R., & Thomas, J. (Eds.). (2006). The new media theory reader. Maidenhead, England; New York: Open University Press. Objectified. Hustwit, G. (Director). (2009). [Motion Picture] Plexi Productions. Jagtenberg, T., & McKie, D. (1997). Eco-impacts and the greening of postmodernity: New maps for communication studies, cultural studies, and sociology Thousand Oaks, Calif.: Sage Publications, 1997. Jensen, K. B. (2002). Introduction. In K. B. Jensen (Ed. ), A handbook of media and communications research: Qualitative and quantitative methodologies. London: Routledge. Kahn, R. V. (2010). Critical pedagogy, ecoliteracy, & planetary crisis: The ecopedagogy movement. New York: Peter Lang. Kellner, D. M., & Share, J. (2007). Critical media literacy, democracy, and the reconstruction of education. In D. P. Macedo, & S. R. Steinberg (Eds. ), Media literacy: A reader. New York: Peter Lang. Lewis, J., & Boyce, T. (2009). Climate change and the media: The scale of the challenge. In J. Lewis, & T. Boyce (Eds. ), Climate change and the media (global crises and the media). New York: Peter Lang Publishing. Mander, J. (1991). In the absence of the sacred: The failure of technology and the survival of the Indian nations. San Francisco: Sierra Club Books. Maxwell, R., & Miller, T. (2012). Greening the media. New York: Oxford University Press. McCullough, M. (2004). Digital ground: Architecture, pervasive computing, and environmental knowing. Cambridge, Mass: MIT Press. Meyrowitz, J. (1998). Multiple media literacies. Journal of Communication, (Winter), 96-108. Mumford, L. (1967). The myth of the machine: Technics and human development. New York: Harcourt Brace Jovanovich. Rayner, P., Wall, P., & Kruger, S. (2004). Media studies: The essential resource. London: New York: Routledge. Sunstein, C. (2006). Citizens. In R. Hassan, & J. Thomas (Eds. ), The new media theory reader (pp. 203-211). Maidenhead, England; New York: Open University Press. Tomlinson, B. (2010). Greening through IT: Information technology for environmental sustainability. Cambridge, Mass. : MIT Press. Williams, R. (1975). Television: Technology and cultural form. New York: Schocken Books. Zittrain, J. (2008). The future of the Internet and how to stop it. New Haven Conn.: Yale University Press. A sample of the key works in this survey included standard undergraduate media textbooks (DeFleur & Dennis, 2002; Baran, 2004; Dominick, 2009; Campbell, 2009); standard media studies textbooks (Devereux, 2007; Hartley, 2002; Rayner et al., 2004); and numerous media literacy curricula.